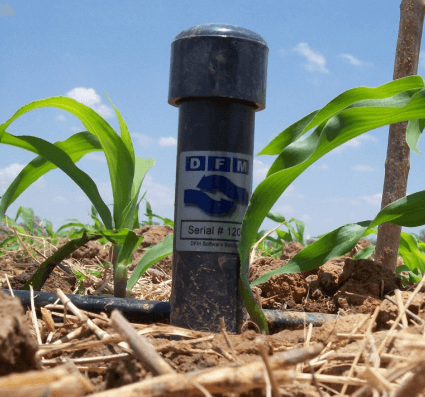 The Continuous Logging Soil Moisture Probes developed by DFM Software Solutions are multilevel soil moisture content and temperature-logging devices. The probe measures moisture content and temperature readings at 6 depths in a soil profile as well as measuring surface temperature. These readings are taken at hourly intervals, but the user has the option to customize reading intervals. If the interval is left to default the probe can store up to 4000 readings locally, which is approximately 5 and a half month's worth of readings. The probes guarantee accuracy and reliability, as they are temperature compensated and are not adversely influenced by salinity levels. They are affordable, easy to use and have proved to be reliable in the field seeing that the outer shell of the probe is made of UV stabilized PVC and the inner shell is a solid resin cast. Through continuous soil moisture content logging, farmers will be able to prevent over and under watering, prevent unnecessary crop stress, promote root development and improve fertilizer uptake. It will also prevent unnecessary energy use and ultimately save costs. The data collected by the probes are downloaded to the DFM Probe Utilities Software, a user-friendly package that provides the user with an abundance of information that can be used to schedule effectively and efficiently. The GPRS probes are designed to send its data to the DFM website which enables clients to access the data from anywhere in the world, provided you have internet access. The data is no longer sent to a logger or a repeater. Good cellphone reception is needed should you wish to use this type of probe. Users can opt for a solar panel repeater box, which has been designed to accommodate Sim Chips. This unit is self-sustaining. Clients are given the option of opting into a 12 month contract where DFM will handle the registration of the Sim Chips (in accordance with RICA laws) and will ensure that there is a contractual data bundle available on the probe to be able to send its readings. When using Short - and Medium range systems, readings are downloaded by use of a mobile logger. The user has to physically go to the planted probe in the orchard to download the latest readings. The probe communicates with the logger via radio signal. The maximum radio distance between the probe and the mobile logger is 5 meters. Users are not required to download probe readings every day. If the reading interval of the probe is left to default, the probe can store up to 4000 readings locally, which is approximately 5 and a half month's worth of readings. The logger serves as the interface between the user and the probe. It can be used to force readings, show the value of the last reading taken, change the reading interval, put the probe into “Sleep” mode, etc. The logger is powered by a 9V battery which is non rechargeable and easily replaced. The logger puts itself into "Sleep" mode to conserve battery power and has an RS232 interface to download the information. The Continuous Logging Probe Long Range System enables the user to download probe readings directly to a computer with the use of long range repeaters. The user does not have to physically visit each probe to download information. All readings taken by the probe over a period of time can be downloaded directly to a computer at the user’s leisure. Probe readings are sent from the probe to a repeater located at the probe site. The repeater sends the data to a Central Point Server (CPS) from where it can be downloaded by the user to a computer. The maximum range of a repeater to the CPS is 1.2km*, but data can be collected from probes that are located more than 1.2km* away from the CPS via the use of a hop-along repeater system. A complex device that makes it easy to see the needs of your plants. The continuous logging of the probes generates easy to understand graphs that will help you save water by irrigating with precision.